The Diaspora project made a big splash when three young students pledged to make a distributed social network to free the masses from Facebook’s whimsical privacy transgressions and walled garden. Three months and $200,000 later the Diaspora project’s source code is now public. However, to get it up and running you need a ruby/rails friendly server and MongoDB for the database. This is not your typical LAMP application. Also, if you make any modifications to the code on your server, you must publish changes according to the GNU Affero General Public License. Although Diaspora is promising the project has just started. If you’re looking for something more mature and built on the LAMP stack here are some alternatives. License: GNU General Public License, version 2. Appleseed is the first open source, fully decentralized social networking software. Social networks are great: you can stay in touch with friends all across the world and find new ones based on your interests. But often, social networks serve a single purpose or interest. For instance photos, videos or classmates from school and university. This is not a problem by itself, but when you want to keep track of all your contacts in all these social networks, this is a lot of work for you to update your contacts list in all the social networks you are in. And you also might need to get a member of a social network, although you’re not interesed in the subject, but only want to track your friends activities. NoseRub only defines the social network and some basic content types like media, links, micropublishing and text. You can now add all your contacts to a NoseRub network and aggregate several social networks into just one. And you always have full control of your data, as you can install NoseRub on your own server and have it connect to other servers out there. Twitter’s new design is about to be rolled out as covered elsewhere. It involves quite a major redesign that includes multi-column layouts and inline media. Quite simply it looks a lot like Facebook now. Since Facebook initially made their interface more Twitter-like this brings it full circle. Media is still hosted on external sites so this means that external sites will get a lot less click throughs for the same bandwidth costs. Although Twitter did work closely with these partners it remains to be seen how this will affect their traffic and revenue. Sites without any added value will probably be eventually rolled into the mothership or collapse. The new design iteration is long overdue and something that will benefit the typical user. One of the only features missing from desktop apps and other applications is the ability to switch between multiple accounts. Aside from ironing out kinks and subtle adjustments, Twitter clears the way for enhancing their advertising platform. The increased visual noise (or activity depending on how you see it) will give them more leeway to introduce more advertising into the mix, not to mention a healthy dose of page views and ability to retain more users on site. One thing that stands out about this years MTV Video Music Awards is how much MTV gets social media. While music will always be a major part of teenage social life, the people running the industry are not necessarily savvy to social media and even antagonistic to new technology (giving them major headaches like piracy). In recent years, MTV has been quietly revamping their mtv.com property by adding more content, making it more usable and integrating a variety of social features. Before the famous user experience designer Dan Cederholm orchestrated the MTV.com reboot in 2007, MTV was a nightmare of a site almost coded entirely in Adobe Flash and lacking any useful content. News stories consisted of headlines and a teaser paragraph. There wasn’t much audio much less video aside from some choppy Real Media streams that only showed short clips. Fast forward to today and they are the top online destination for music videos and leading a variety of initiatives that fully embrace social media. Reality TV shows like Jersey Shore are giving MTV ratings they haven’t seen in years. The cast of Jersey Shore are becoming a social phenomenon unto themselves, leveraging social media like Twitter and Facebook to extend their reach and keeping the personal touch. It is no wonder that MTV can easily push big events like the Video Music Awards and all the drama around it to the forefront of Twitter trends. Last year’s VMA moment was definitely when Kanye West stormed Taylor Swift’s award speech to rant that Beyonce Knowles had the best video of all time. It was an embarrassing moment for Kanye that could have ended his career. He was widely criticized across blogs and social media to the point of warranting the famous “jackass” comment from President Obama (that was supposed to be off-the-record). After the incident Kanye issued some statements and largely stayed out of the spotlight while the paparazzi chased him around. At the beginning of this month Kanye began addressing events from last year’s VMA directly by starting with an apology and making many impassioned pleas. 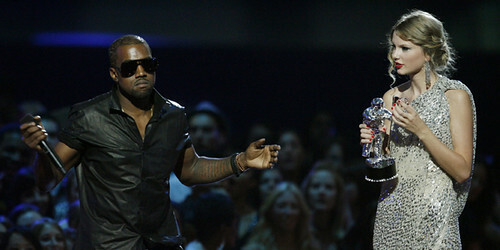 At this year’s VMA Taylor Swift performed a song titled “Innocent” that seems to address the Kanye incident. While most people lauded her performance there was also a considerable backlash on Twitter telling her to “grow up”, “get over it”, or criticizing the quality of her performance. Lyrics such as “32 is still growing up now … you’re still an innocent.” were seen as condescending by some. Kanye West deliverd a solid performance of “Runaway” with lyrics like “let’s have a toast to the douchebags” that was both apologetic, honest but still cryptic. Although there’s nothing he can do change the past and some will hate him forever, he has definitely navigated past a situation that would have killed the career of anyone else not as talented or deft with social media. Celebrities continue to dominate Twitter (Justin Bieber accounts for 3%). Social media is powerful and like anything so powerful it can be a double-edged sword. It’s tricky to navigate and any upcoming artist needs to savvy with it. Social funding is probably one of the most interesting developments to come out this year. Fund-raising on the internet is nothing new and everything from raising money for medical treatment, restoring stolen property, buying a new computer or whatever. Pledge and donation buttons abound on the internet. However, as anybody displaying those buttons will tell you it is hard to raise money alone. One thing Kickstarter and similar startups have changed is the notion of social funding. Many have noted how little it takes to create an internet startup with the commoditization of servers and freely available open source tools, all you need are imagination and drive to really bring something to reality. However, that doesn’t mean that you don’t need money. Social funding allows creative, ambitious individuals to quickly gain initial capital to make their visions reality. A tour of popular projects on Kickstarter represents a wide variety of projects from music, film, design, to software. Backers or sponsors agree to pledge a fixed amount as set by the project originator. If funding reaches the goal amount by deadline, backers get charged. Otherwise the project fades out. Successful projects must then provide the output promised and deliver goods to backers. Most project goals are in the range of several thousand dollars with pledges starting at $10. The beauty of this approach is that supporters also form your core audience helping to spread the word through social media such as Twitter or Facebook. It’s hard to dismiss a friend raving about a project that they just donated $10 as spam, because they are putting money where their heart is. Diaspora, the project to create an open-source, distributed, and self-hosted version of a social network, raised over $200,000. The amount of money came with no strings attached and would put lots of angel rounds to shame. Although the initiative came at the right moment, just as Facebook tried changing user privacy to make things more “open”. Getting a project fully funded means that the project must have a clear purpose. Since funding is effectively a donation, with a token material reward, it is no surprise that successful projects involve noble motives (change the world for the better) or have aesthetic resonance (eclectic art that strikes the right chord). Ensuring your project gets funded involves quite a bit of strategy that involves smart marketing in addition to presentation quality, although timely projects might get a chance push from word of mouth. However, the biggest appeal is perhaps the lack of strings attached and the low risk for both project organizers and supporters. Whether your field is IT, music, film or performing art, it is now possible to make your vision a reality with the right amount of preparation using tools readily available to you. Being savvy with social media is no longer about being internet popular but a way to find an audience and now there are a growing number of ways for people to tap into that pool for micro-funding. Bloglines, one of the big RSS readers before Google Reader, just headed to the dead pool. Surprisingly, even “visits to Google Reader are down 27 percent year-over-year“. Competitors for RSS reader services have all died long ago. While Bloglines let the product slip into neglect, it’s still quite shocking to see that we are now left with Google Reader alone. The most telling part is that, as of now, not many of the major blogs are even talking about the shutdown of Bloglines. What happened to RSS readers? The prevalent argument is that social news networks have replaced the need for RSS readers. In fact, according to a recent CNN survey, 75% of people get their news from email or social media. The argument is if you don’t hear about it from the people you’re connected with, it’s probably not worth knowing. Twitter is definitely a wealth for news because you have links and updates. You literally have access to people experiencing it in real time and the analysis and reactions to these events coming at you real-time. Sites that aggregate the flow of information to show you what’s hot like Tweetmeme are really useful and the results are always fresh though it might not have the personal touch of TechMeme. At the end of the day, RSS readers stop scaling very fast when you have a steady stream of content from a growing number of sources. Pruning and tending to your RSS subscription list can be a task of its own and you need to be constantly on the lookout for great content. However, no matter how you try, even with one hundred feeds or so there’s no way you can stay on top of all your feeds. There are many companies trying to innovate by making it easier to discover news that’s relevant to you, usually in combination with your social graph such as Flipboard. The need for information that is both timely and relevant is a fundamental need for us as social creatures. We will continue to see innovation in this space but now that Google is the almost the last RSS reader standing, I hope we see something great rise from the ashes. Recently a Stanford student created YouTube Instant. Not only was feedback for it instant and viral he got a job offer from the co-founder of YouTube. The IT industry is known to set trends and tends to be ahead of the curb in certain areas. One of these is definitely the job market and working style in general. Lots of IT jobs are suited for flexible hours and telecommuting. What’s more the people understand the value of empowering smart individuals and not adhere to meaningless metrics. To be young and talented in this age is to be given the chance to jump ahead to create your brand or launch a world-changing product before you even become an “adult”. As summarized here, Apple just updated their App Store’s terms and guidelines. Although they still leave lots of room for interpretation and cut themselves plenty of slack, the announcement brings a breath of fresh air with it. Already the third party Google Voice app is being prepped for submission, Adobe is resuming work on the Flash to iPhone conversion tool, and AdMob is breathing a sigh of relief. It’s definitely a step in the right direction and strategic. As Apple commands more mind share and exerts a disproportionate amount of influence on the smart phone market, it becomes more important for Apple to be seen as fair to keep regulators off their back. Despite Apple’s growing prominence, as other platforms such as Android collectively catch up, their market position will become less impenetrable. While it will be very hard if not impossible to match Apple’s polish with the iOS, once the Android interface and usability reach a certain point it will become “good enough” for average consumers just like Windows continues to dominate in the desktop operating system. Right now the main competitive advantage of the Apple mobile platform is the seamless experience you get as a consumer, stable and consistent APIs (and degree of backward compatibility) across the iOS devices not to mention excellent documentation (official and unofficial) for developers, and attractive revenue streams for businesses. So much of the success in this market is built on ensuring users and other businesses participating in the App Store and keeping it vibrant that it’s a smart move to iron out all the issues and concerns expressed by communities before other platforms catch up. Digg’s woes continue with their new architecture. The rewrite is a mythical dragon in the software world that lives in a cave and occasionally wipes out entire cities. The idea for a web application is that you create all the software from scratch, leaving the data in tact, then on the big day you do a sleight of hand and “voila!” your site is running on a brand new platform. You avoid all the mistakes you made along the way in architecture design and rid yourself of nasty legacy code written by that snarky engineer you fired for incompetence years ago. Now your set for years of growth on a platform that scales with ease and grace. Everything is just faster. Engineers are happy. That’s the theory but it rarely happens in practice. In reality, engineers are working overtime for months on end with no weekends slowly getting disillusioned by the sheer amount of work involved. The technical leads start seeing other unforeseen issues with the new architecture that lead to potential problems. Data needs to be preserved and migrated seamlessly. As the rewrite drags on code gets sloppier and what’s more there’s no feedback from the real world so people are coding against a subset of test data and not getting pounded by real traffic. When the rewrite does go live, people rejoice, and then the “wait” begins (negative feedback or bugs, lots of bugs). When the system starts coming down in flames everyone’s overworked and drained, not to mention a part of them let go when the switch was flipped, so it takes a lot of mental effort to get back into the flow. Stress levels are even higher than during the rewrite. People start panicking and yelling. Everyone’s unhappy and full of regret. Of course, this is when rewrites go terribly wrong. Rewrites will always involve some kind of negative adjustment. There are cases where products vanish from the face of the earth after a rewrite because the product becomes something totally different or the competition keeps chugging along while you’re fixing problems. It can be done in style like Foursquare did. Reddit also rewrote their system (not counting the original version done in Lisp) from one framework to another. It can be painful but rewarding in the long-term like Apple’s rewrite of the OS which gives us OS X and provides the underpinnings of their current success. Digg’s current rewrite involves both architecture and function which is rarely a good thing. On the surface it makes a lot of sense, if we’re going to write it from scratch why not improve the algorithms and functionality in one go. However, in practice, it’s hard to fix things that are broken because your fixing something totally different. One thing about Digg’s current predicament is the circumstances the VP of Engineering was either fired or quit in the middle of this crisis. If he was fired, it begs the question why because he’s the one who made the decision and should be the one to fix it or guide the team in the right direction. If not, he shouldn’t be leading the team to start with. Of course, his past experience aside from being “VP of Engineering” doesn’t seem to indicate anything relevant to running a highly trafficked web application. If he did walk out on his own, that’s also not good because you’re basically leaving a mess behind you. Either way it’s career suicide and I wonder what would lead to this kind of drama. On the plus side, Digg is getting lots of attention of late from all the drama surrounding the rewrite. The dust will eventually settle as the issues get sorted out and hopefully they’ll be able to incorporate feedback to make the site better. Clouds are all the rage but as we move more of our stuff into the cloud you have to wonder what happens when the cloud dissappears? As a rule, reputable cloud providers be it hosting or web services always give us multiple backups. However, that doesn’t mean disaster can’t strike. For example, what happens if you put all your photos online and you get shut down for a TOS violation? Even if you eventually prove your innocense there are many people who have had their accounts shut down and content deleted without any recourse. This is where I see services like Backupify filling in a nice gap. However, getting your data out of the backups and onto another service becomes more and more prohibitive as you accumulate more data and that’s something that can’t be solved without dramatically improving data transmission speed and removing I/O bottlenecks. Just recently 3PAR, a cloud storage company, was acquired by Dell for $1.6 billion.